A contemporary style, luxury all-inclusive beach resort. Room Amenities: Spacious Caribbean style decor rooms located on floor two and three with one king size bed, featuring tropical garden views. Room Amenities: Spacious Caribbean style decor rooms located on floor two and three with two double beds, featuring tropical garden views. Room Amenities: Spacious Caribbean style decor with two double beds located on the ground floor featuring a Tropical garden view. Room Amenities: Spacious Caribbean style decor with two king size bed located on the ground floor featuring a tropical garden view. Room Amenities: Spacious Caribbean style decor with two double beds located on floor two and three, featuring Tropical garden view and pool view. Room Amenities: Spacious Caribbean style decor with one king size bed located on floor two and three, featuring Tropical garden view and pool view. Room Amenities: Spacious Caribbean style decor rooms located on floor one through three with two double beds, featuring tropical garden views. Room Amenities: Spacious Caribbean style decor rooms located on floor one through three with one king size bed, featuring tropical garden views. Room Amenities: Spacious Caribbean style decor with two double beds located on floor one to two, with a view of the pool. Room Amenities: Spacious Caribbean style decor with one king size bed located on floor one to two, with a view of the pool. Room Amenities: Spacious rooms located on the ground floor with direct access to the main pool from the terrace with one king size bed. Room Amenities: Spacious rooms located on the ground floor with direct access to the main pool from the terrace with two double beds. Room Amenities: Ocean view with two double beds located on floor two and three. Room Amenities: Ocean view with one king size bed located on floor two and three. Located on a beautiful, palm-studded, white sand beach in Playa Bavaro, and only 11 miles (18 kilometers) from the Punta Cana International Airport. This colorful Caribbean resort offers adults a seaside escape to romance and many daily and nightly activities. Dog Must Be on a Controlled Leash at All times or in a Dog Carrier When Not in the Guest Room. Guest Room Cleaning Services Will Not Be Carried out Unless the Guest Is Present. The Dog Owner Must Be in the Room If the Dog Is Present When the Guest`s Room Is Cleaned, in Order to Not Frighten the Pet and to Avoid the Risk of a Pet`s Escape. Please Contact the Concierge to Schedule Convenient Cleaning Times. The Resort Reserves the Right to Request the Dog`s Removal If the above Guidelines Are Not Adhered To. Restrictions, Guidelines and Availability Are Subject to Change at Any Time. Himitsu: Dinner Fusion of a La Carte Pan-Asian and Hibachi Delicacies with Spectacular Ocean Views. Reservations Required for Seating at Teppanyaki Tables. Offering six bars and lounges serving top-shelf spirits. SIP, SAVOR and SEE DINING EXPERIENCE: This section will include the short description highlighting the Sip, Savor and See Dining Experience. As part of the privileges of Unlimited-Luxury, Guests of Secrets Royal Beach the chance to Sip, Savor and See all Secrets. Breathless, Dreams, Now and Sunscape Resorts and Spas in the region. Enjoy dinner and live entertainment at participating sister properties including sipping complimentary cocktails, savoring delicious cuisine at the restaurant of your choice and the opportunity to see that evenings entertainment. The Sip, Savor and See Dining Experience is only good for dinner at a qualifying sister resort. This is not a day pass. Guests must make arrangements through the resort concierge by 3:00 P.M. Guests may choose to dine at any of the restaurants that are serving dinner. Guests are responsible for cost of transportation to and from the resort. A maximum of four people are allowed per seating. Special restrictions may apply for Christmas and New Year`s Eve dinners and special events. Guests can utilize the facilities at the resort they are visiting from 6:00 P.M. to 1:00 A.M. including bars and theater. Note: Sip, Savor and See dining experiences may be limited due to private events or resort buyouts. The Secrets Royal Beach provides the perfect venue for conventions, weddings, meetings or other social events. The hotel meeting rooms have capacity of up to 886 attendees in an auditorium style setting and up to 650 for a banquet event. Book seven or more nights at the Junior Suite Ocean View or higher room category for a stay within three months of your wedding and receive this package for Free (value of $950 USD). Couple must present a copy of their wedding invitation or marriage certificate at the time of check-in. Not available during Christmas and New Years Eve and cannot be combined with the Secrets Wedding in Paradise Package. Subject to availability and double occupancy only (gratuity included). Selling Price: $299 USD or complimentary when staying five nights in a Preferred Club Junior Suite Partial Ocean View or higher. The Secrets Resorts and Spas Pop the Question Engagement Package cost is $299 USD per stay, which is added and supplemental to the room you purchase. Pricing is based on double room occupancy. Engagement package details can be arranged upon arrival. Additional terms and conditions for any package add-ons will apply. Please request the proposal package at the time of booking (payment is required at check-in upon arrival at the resort, this package is payed directly to the resort). Package and pricing subject to change without notice. Blackout dates and restrictions may apply. This entire offer is subject to availability and can be modified or closed out at any time. NOTE: Packages have restrictions and additional fees may apply. Guests can also experience the challenging signatures Golf courses in the area. Lessons and equipment rental are always available for beginners. Please contact the concierge upon arrival to make tee time arrangements. Secrets Royal Beach takes great pride in offering world-class entertainment. 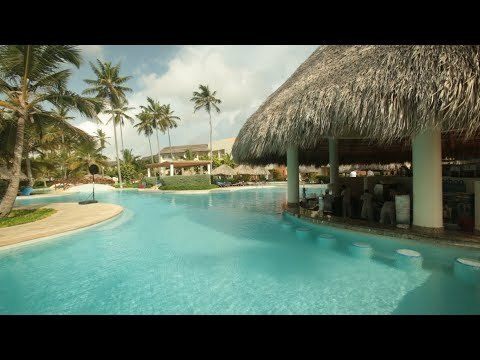 Stay at one Play at two, Guest will have complete access without charge to all-inclusive facilities at Now Larimar Punta Cana Resort which is a kids friendly property. Two-level beach cabana with sun deck, featuring private butler service, bottle of sparkling wine, premium snacks and top-shelf spirits. Available from 10:00 A.M. to 5:00 P.M. Reservations with the concierge are required. Indoor theatre featuring live shows and nightly entertainment, nightly outdoor entertainment, theme nights, Dominican Tianguis weekly market featuring local handicrafts, art and jewelry, Eclipse Nightclub chill out open-air disco and lounge with swimming pool with view to the stars, On-site Casino next door at Now Larimar, weekly cocktail reception with the executive team, weekly foam party at the main pool, theme nights weekly at the pool or on the beach (weather permitting).